The House of Representatives became polarised yesterday at plenary when a motion to suspend Executive Order 006 on asset forfeiture signed by President Muhammadu Buhari came up for debate. Signs of what to expect from proponents of the motion became apparent when Olabode Ayorinde (APC, Ondo) stood up to make his contribution and introduced himself as a member of reformed All Progressives Congress (R-APC). The lawmaker was shouted down by a number of his colleagues, who took exception to that sort of introduction. He, however, insisted that he has every right to belong to any political party of his choice. Another member, Olarinoye Olayonu (APC, Kwara), who was also asked to second a motion for amendment, took it further that members should be free to introduce themselves the best way they could to the applause of some of his colleagues. However, when Speaker Yakubu Dogara put the question for the motion of urgent national importance moved by Nicholas Ossai (PDP, Delta) and 26 others and gave it to the Ayes, the floor went into a frenzy. Supporters of the motion were seen jubilating and hugging each other. But the opponents continued shouting “No, No”. When the Speaker banged the gavel and gave it to the Ayes, a number of lawmakers made their ways out of the chamber despite the fact that the business of the day as listed on the order paper had not started. The Nation reports that the motion was debated for more than one and half hour. 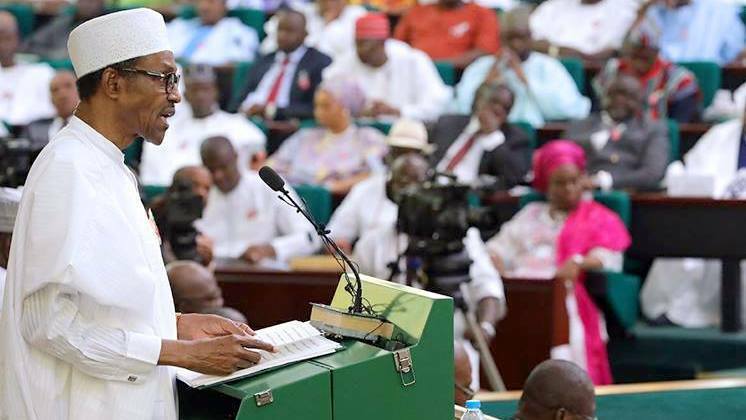 In its resolution, the House urged President Muhammadu Buhari to suspend the application and implementation of Executive Order Number 006 of 2018. According to the lawmakers, the order, which was on forfeiture of assets acquired through proceeds of crimes, was not only controversial in nature but conflicts with relevant provisions of the law. While an ad hoc committee is to be constituted to scrutinise and investigate all Subsidiary Legislations and Executive Orders, the House has also summoned the Minister of Justice and Attorney General of the Federation (AGF), Idris Malami and the Chairman of Nigerian Law Reform Commission, Kefas Magaji, to appear before the it and submit a comprehensive list of all Subsidiary Legislations in Nigeria that are published in the Federal Gazette within two weeks. Ossai, in his submission, noted that the Executive Order Number 006 of 2018 signed into law by Mr. President on July 5, 2018, which inter alia empowers the Executive to restrict dealings in suspicious assets subjected to investigation or inquiring bordering on corruption appears to have hijacked and usurped legislative and judicial powers by the Executive. According to him, Section 44 Sub-section 2(k) of the 1999 Constitution (as amended) restricts the application of compulsory acquisition of moveable or immoveable property in any part of Nigeria, except on the temporary taking of possession of property for the purpose of any examination, investigation or inquiry. Supporters of the motion were unanimous in their argument that the Executive Order was an erosion of the powers of the legislature and the judiciary. But the opponents said the President has not breached any law in his efforts against corruption. Ofongo Daniel (PDP, Bayelsa) noted that lawmakers were not against anti-corruption fight of the government but that the Order breached section 1 of the Constitution, adding that it should be enough if the any anti-corruption matter is in court. Dennis Agbo (PDP, Enugu) said the Order was like a military decree: “This is an attempt to usurp the powers of the legislature and judiciary,” he added. Nuhu Danburam (APC, Kano) said President Buhari was wrongly advised by his aides on the Executive Order. Prof. Majeed Alabi (APC, Osun) said the motion was incompetent, hasty and premature. Affirming his support for the Order, Alabi said the President was constitutionally empowered: “What the President did was in order considering what is going on in this country. How did the Order usurped legislative power as contained in Section 6?” he demanded. Sadiq Ibrahim (APC, Adamawa) went further to add that Chapter 5 of the laws of the Federation as passed by the National Assembly vested on the President the powers to carry out the duty he performed on the Order. He noted that Section 26 (1) made it clear that seizure of assets be carried out through search, arrest or through a court of law. Nnanna Igbokwe (PDP, Igbokwe ) told his colleagues that the intendment of any Executive Order is to elevate the law, while adding that Executive Order was backed by law. When the Speaker put the motion to question and giving it to the Ayes, the floor erupted with the opponents of the motion shouting their disapproval and disappointment and the jubilant winners were seeing hugging each other. Some of the aggrieved lawmakers made their ways out of the chamber. The Speaker, however, wasted no time in calling for the next item on the order paper.